Updating the flooring in your home can bring about many great results. We’ve come up with a few reasons why you should update your flooring or carpet! It can make your home healthier. Old flooring and carpet hold dirt, pet hair, dust, pollen, and allergens, making your home unhealthy no matter how much you clean it. Start fresh with new carpets and flooring, and spend less time scrubbing, mopping, and vacuuming! It is a simple update with a lot of punch. Updating your flooring can alter the whole feeling of a room with just a simple change. Different styles of flooring bring different looks to a room, so think of the style you’re trying to convey and pick what matches your idea. It will help your home sell faster. 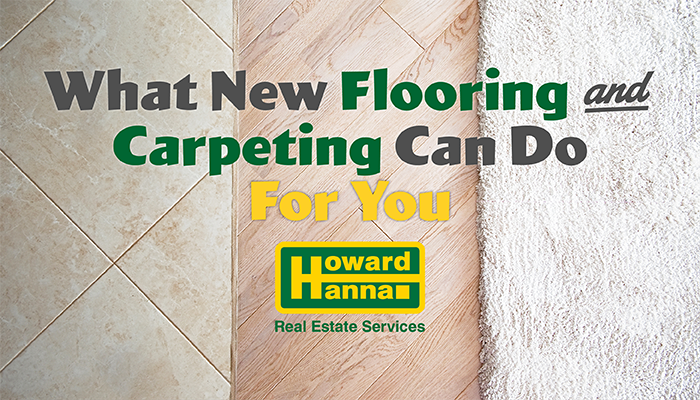 While it’s unknown if updating your carpeting and flooring can actually increase the value of your home, it might result in more interest from buyers. Fresh flooring adds to the “new home” feel buyers are seeking, regardless of your home’s age. Buyers will enjoy the clean, brand-new flooring, but be sure to choose a neutral color or tone that will appeal to all buyers. Updating your flooring, whether you choose carpet, hardwood, vinyl, ceramic, laminate, linoleum, or hardwood, can make a big difference. Howard Hanna’s Reality Alliance Partners have a vast selection of stylish, high-quality flooring options, from residential to commercial grade. You are guaranteed quality products, professional installation, and the lowest price available. Take a look at our Carpet and Flooring experts today!